The 1965 Porsche Type 356 C Cabriolet that once belonged to Janis Joplin is heading to auction on December 10, 2015. Janis Joplin may have longed for a Mercedes-Benz, but she actually drove a Porsche that's now on its way to the auction block in New York. The singer's wildly painted 1965 Porsche 356C Cabriolet will be auctioned Dec. 10 by RM Sotheby's in New York. The car has been featured at the Rock and Roll Hall of Fame and Museum in Cleveland for the past two decades. It's being sold by the Joplin family and is expected to bring more than $400,000. "Tonight Show" host Jimmy Fallon challenges Ariana Grande to a game of random musical impressions, such as Christina Aguilera singing "The Wheels on the Bus." 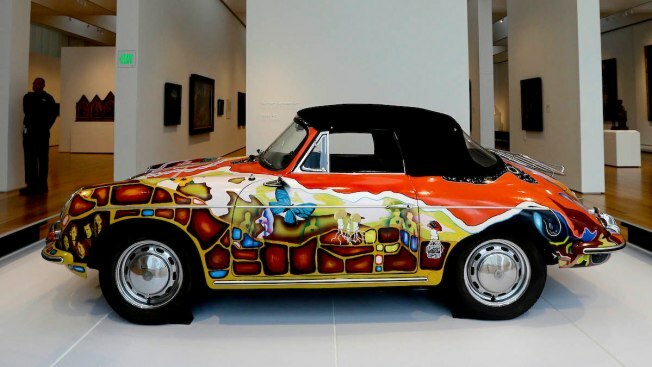 Joplin bought the pearly white Porsche in September 1968 and got a friend to customize it with a psychedelic mural. She drove it regularly until she died of a drug overdose in 1970. The car was given a meticulous restoration in the early 1990s.